OxyGeneo’s Skin Tightening treatment using Tripollar RF technology delivers impressive results, even after your very first treatment. In this treatment, focused RF energy is delivered to the skin surface and tissue layer. This action stimulates the area and generates natural collagen. The increased amount of collagen in the skin leads to incredible benefits and results. OxyGeneo RF technology is the 3rd and latest generation and MOST advanced radio frequency (RF) technology in the industry. Skin Tightening treatment using Oxygeneo Tripollar RF Technology is an effective, painless and non-invasive skin treatment with immense benefits. TriPollar RF treatments give the skin a fresh, tight, rejuvenated appearance. OxyGeneo TriPollar handset delivers focused RF energy to the skin surface and subcutaneous layers. ,The energy heats the skin and causes the collagen fibers to contract inducing immediate skin tightening. TriPollar RF energy is known to stimulate natural collagen generation which results in substantial improvement in the appearance of wrinkles. Never before has a facial treatment offered such instant and effective results in a pleasant and relaxing way. This treatment, when combined with OxyGeneo 3-in-1 Super Facial, produces incredible results, that have to be seen to be believed. Who should get RF Skin Tightening Treatment? OxyGeneo’s Tightening treatment is best suited for those with mild to moderate sagging of facial skin and tissue. RF Skin Tightening treatment is also well suited for reducing wrinkles and fine lines. This Tightening treatment is ideal for those who don’t want to have a surgical procedure. What should I expect after my RF Treatment? Immediately after your first treatment, you will notice that skin in the treated areas feels tighter, less saggy and revitalized. You will notice that wrinkles and fine lines are less intense. For maximum benefits, multiple treatments are required over a prescribed period of time. There is no down time. Which areas can benefit from OxyGeneo Skin Tightening Treatment? This Treatment is commonly used to treat the forehead, areas under the eyes, cheeks, mid-face, jaw line, and neck. It produces immediate results. The treatment is most effective when combined with OxyGeneo’s 3-in-1 Super Facial. Can I have OxyGeneo Tightening treatment to look better before a social event? Yes! Since this treatment has no downtime, you can have the treatment on the day of your social event. Your skin will look tight and sculpted. You will feel a remarkable reduction in wrinkles and fine lines. 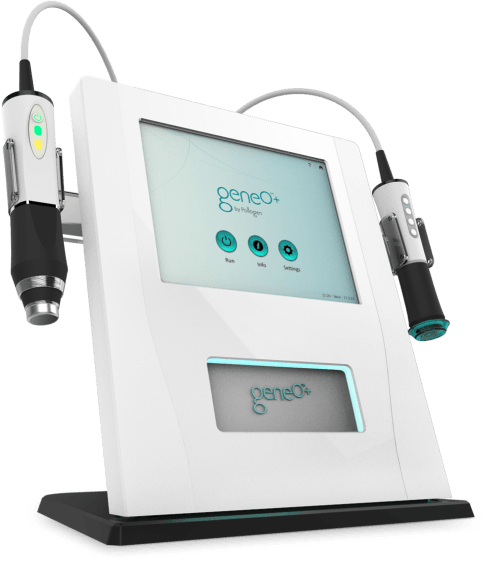 Schedule your OxyGeneo Tightening treatment on the day of your event or one day before. The amazing results of your Oxygeneo treatment will be visible during the event.